+39 0471 311000 Later trains: 18:01 change at Brenner arr. 20:29; 19:30 direct arr. 21:38. SAD bus (9:10) to Kastelruth/Castelrotto (10:00), then Silbernagl bus (10:00 or 10:15) to Compatsch/Compaccio (10:25 or 10:40). Walk from there (1844m) 3 hrs on path 10 then 5 to Schlernhaus/Rif. Bolzano (2457m). Two ski lifts available, Panorama and Frommer-Spitzbühel. Refreshments at Saltnerhütte (1850m). Same bus (9:10) or later bus (11:10) to Völs/Fiè (9:40 or 11:40). Walk from there (880m) 4½ hrs on path 1 to Schlernhaus/Rif. 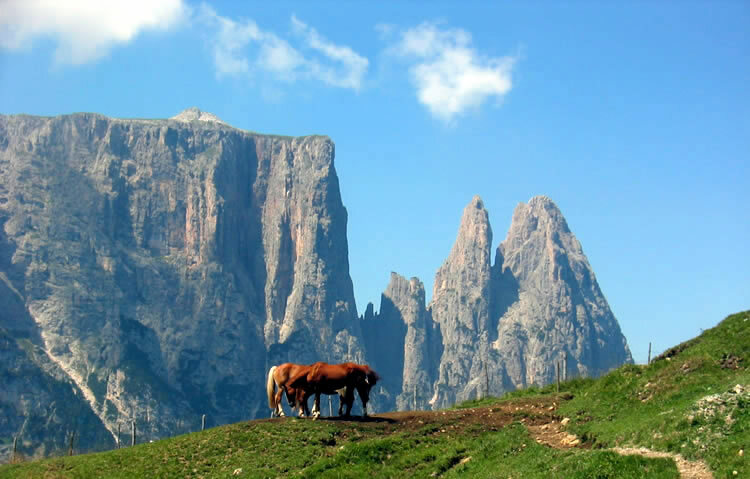 Bolzano (2457m). Refreshments at Sessel Alm (1940m). Bus 36km, walk 7km with 600m ascent (3 hrs). Bus 16km, walk 9km with 1600m ascent (4½ hrs). Buses from Bolzano call at the railway station 2 mins after leaving the bus station. From the rifugio, optional excursion to M. Pez (2564m, 30 mins total). Monday 21/7 Walk 2½ hrs on path 3 then 3a to lunch at Grasleitenhütte/Rif. Bergamo (2134m). Tuesday 22/7 Walk 2¼ hours on path 541 then 550 over Tschager Joch/ Passo delle Coronelle (2630 m) to lunch at Rosengartenhütte/Rif. A. Fronza alle Coronelle (2283m). 0462 764450 Alternative morning route: walk 1 hr on path 542 to Gartlhütte/Rif. Re Alberto I (2621m) then 20 mins to Santnerpasshütte/Rif. Passo Santner (2734m) then down easy via ferrata. Wednesday 23/7 Walk 2¼ hrs on path 541 over Passo delle Cigolade (2550m) to lunch at Rifugio Vaiolet/Vajolet Hütte (2243m) where we stayed on Monday night. 0462 602272 Alternative afternoon route: walk up path [unnumbered on map] over Forcella delle Pope (2650m) then path 583 over Passo di Lausa (2700m). Thursday 24/7 Walk 2¼ hrs on path 580 over Passo di Dona (2516m) and Passo delle Ciarégole (2282m) then path 555 and 532 to Mahlknechtjoch/ Passo di Duron (2204m) and lunch at Seiser Alm Haus (2145m) or it might be Rifugio Dialer. Friday 25/7 Walk 2½ hours on path 594 to Passo Sellajoch/Passo Sella then 526/526A to lunch at Langkofelhütte/Rif. Vicenza (2253m). Walk 2¼ hrs up path 525 to Demetzhütte/Rif. Demetz (2681m) then down about half way to Sellajoch/Passo Sella and turn right onto unnumbered path direct to the hut. Same as previous night No big packs! Saturday 26/7 Walk 1½ hours down path 528 to Campitello. Or there’s a cable car from Col Rodella. Alternative bus from Sellajoch/Passo Sella (10:50) to Siusi (12:25), time for a snackette, then route 118 from Siusi (13:13) to Bolzano (13:55). Later bus from Campitello (16:49) to Bolzano (18:28), or from Sellajoch (17:15) to Ortisei (18:10) then Ortisei (18:14) to Bolzano (19:08). 18:40 flight KL1093 arr. Manchester 19:00 Later train 12:31 arr. 14:32.